Inking Idaho: My Crazy Husband! I do have a nice card to share with you before I show you my crazy family! Once again, playing with my Branch Out stamp set. This one uses flowers from the Trio Flower punch and the kitty from All In The Family. I REALLY love this set!! OK, now on to my crazy family...well mostly my husband! 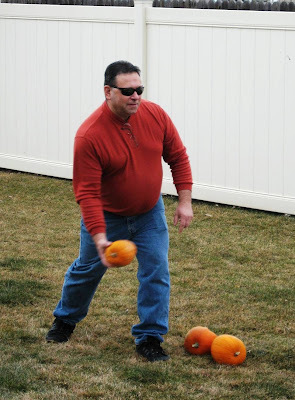 Years ago when the boys first started playing baseball, George thought it would be funny to pitch the pumpkins to them at the end of the fall season. Needless to say it has become a bit of a season-end tradition. 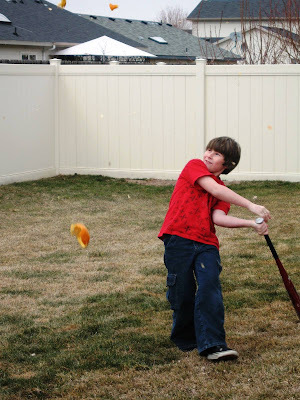 This year, living in Idaho, the pumpkins froze and it snowed before we had the chance to play pumpkin baseball so we kept them in the garage until a nice day came along. Dad lined them up and the boys went crazy with excitement! Benjamin hit it right on! 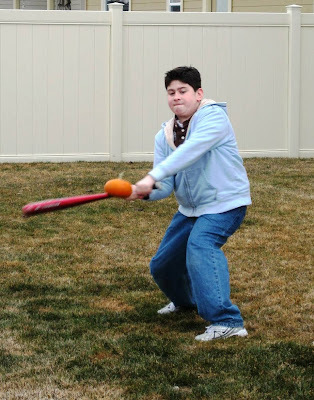 Nicholas blasted the pumpkin to smitherines!!! Now did I tell you I have a crazy husband?!! Gotta love him!! Have you seen "Cheaper by the Dozen" with Steve Martin?? He and his movie family play "Apple Schmere". Very similar only they use apples and tennis rackets. You should check it out it's pretty messy and fun! Adorable card, hilarious family tradition! Beautiful card Becky...I can't wait for my Branch Out stamps to arrive now. Your family - well what can I say they are boys and they keep it fun & interesting. that is too funny. one of my sisters(i have 6)plays tomatoe baseball with her daughter at the end of the season.now thats a mess! Too funny! How did you get such nice weather in Idaho?? Must be what came our way in Michigan today, it has been in the teens and sub zero, its to be 65 today, and then back to the 30's and teens at night....not fair! 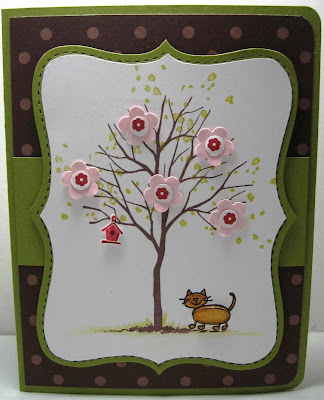 Love the card....great idea with the kitty, I just got the Branch Out set from SU yesterday....fun~fun day! You are rocking with this Branch Out set!! Can't wait to get mine (it is currently backordered I guess.) Love your family tradition- sounds like something my kids would love! Cute card! Smashing pumpkins sounds like something my husband and kids would do. WooHoo what fun with the pumpkins and dad!! Oh yea, liked the card too...lol. Thanks for sharing. He is crazy! But, crazy is fun!! Looks like they had a great time! Love the card too!! Love the card - and looks like you have a family that really enjoys each other's company!! Such fun! Your family looks like a lot of fun! I also love your creativity and blog so the Serendipity Sisters have given you an award! Thanks for your inspiration and great ideas. Visit our blog to get it. As I understand it you are supposed to pass this award on to seven other blogs. Love your work.